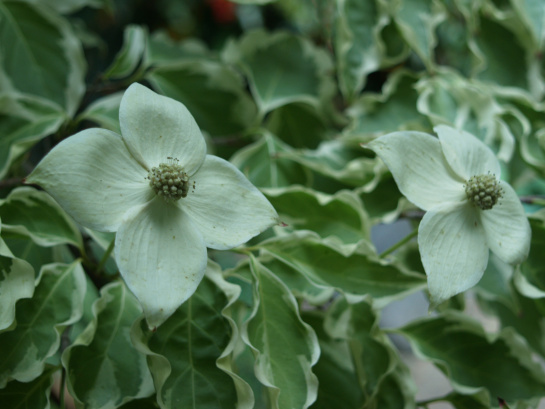 Dave in Virginia has posted the most beautiful photos of his Cornus Kousa “Samaritan” on his blog. I have native American dogwoods in my garden but his pictures are enough to inspire longing for this Chinese dogwood. In May, I was quite pleased to finally have flowers on the ‘Samaritan’ Chinese dogwood (Cornus kousa ‘Samaritan’ below). The dogwood, with excellent green and white variegation, is planted along stone steps that descend from one patio to another between two small ponds in the upper garden. The tree is prominently viewed from the kitchen window, and though it has grown vigorously to at least fifteen feet, the absence of flowers has been a bit disappointing. ‘Samaritan’ has been partially shaded by a tall threadbranch cypress (Chamaecyparis pisifera) and a wide spreading Fernleaf Japanese maple (Acer japonicum ‘Aconitifolium’), and while this has not slowed its growth, it has evidently inhibited flowering. To my eye there appears to be sufficient light, but as is often the case, my vote doesn’t count.